100AM in Tanjong Pagar is now home to the latest Japanese Restaurant food cluster, Itadakimasu by PARCO. Itadakimasu houses 7 restaurants under its roof, and the offerings pretty much sum up the variety of Japanese food found in Singapore. The restaurants include Nadai Fujisoba NI HACHI, Numazu Uogashizushi, Ramen Keisuke Tori King, Saboten, Yayoi, Shabu Shabu GYU JIN and Yakiniku Heijoen. I have not stopped raving about my new found love since I walked through the vermillion torii (gates) of Nadai Fujisoba NI HACHI. Established in 1966, it is recognised as the soba restaurant with one of the longest histories in Japan and boy are we glad that it has finally arrived on our tiny island! Nadai Fujisoba NI HACHI takes pride in serving authentic handmade soba that has a 2:8 ratio of flour to buckwheat with an original broth (dashi) that is specially made with a blend of dried bonito and kaeshi (a mixture of soy sauce, sugar and well-aged mirin aka sweet sake). There is a variety of soba to select from: hot or cold, vegetables, seafood or meats. The Hot Kamo Nanban (soba with slices of duck) and Hot Buta Curry Nanban Soba (curry soba with pork) are both flavorsome bowls that you must not miss. 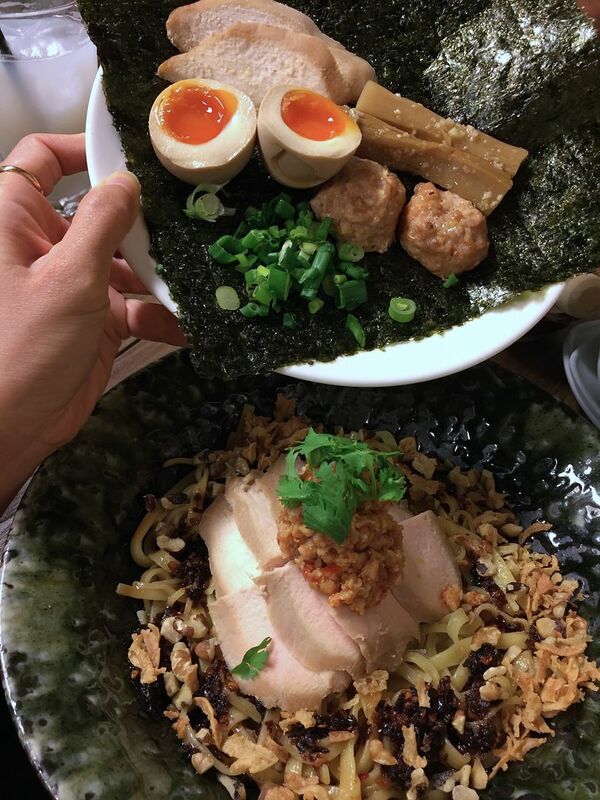 Meats are tender and the broths (yes, even the curry,) are light and full of umami goodness. It is difficult not to love Special Truffle Dashi Maki Tamago with Club Japanese Sauce. Move aside, onsen tamago! With shreds of crabmeat in the sauce, this funky Japanese omelette is a winner. My only wish is that the restaurant opens earlier so that I can have this for breakfast! Other signature dishes at Nadai Fujisoba NI HACHI include Tempura Soba, Kano Maze Soba (dry soba with duck) and Kamo Nabe (duck shabu shabu). The Kano Nabe sure calls for a gathering of friends! Another well-established restaurant housed in Itadakimasu is Numazu Uogashizushi. Being one of the restaurants that have coveted auction rights in Numazu fish market (Shizuoka Prefecture), you can expect fresh sashimi and sushi at this sushi restaurant. Did I mention that the slices of fish are very generous too? What is a better place to get Tonkatsu than Saboten? At this Saboten outlet, besides Saboten’s signature Tonkatsu sauce, there is also yuzu soy sauce and goma sauce available for dipping the delish fried pieces! And on the topic of fried… Cheese + Panko + Fried = Heaven. You want to order either Loin Katsu or Tenderloin Katsu sets so that you can get your hands on the irresistible cheese katsu! Good news for fans of Keisuke! There is now an additional outlet in Tanjong Pagar for your favourite ramen. Ramen Keisuke Tori King at Itadakimasu offers four new items on its menu—Tori King Ramen (Clear Soup), Tori King Tan Tan Mien (Ultra Super Rich), Tori King Dry Noodle (Maze Soba) and Tori King Dipping Noodle (Tsukemen). I was in the mood for some dry and fat noodles, so Tori King Dry Noodle (Maze Soba) was the choice. Interestingly, the noodles in the bowl resemble our local mee pok. Although there was a splash of Keisuke’s original spicy sauce and vinegar, the bowl of ramen was blanketed with thick sweet sauce (even though I ordered mine with more chilli) that was cloying after a few mouthfuls. I’ll remember to stick to broth ramen the next time. Japanese food at affordable prices.